In 2014 I was awarded a Public Commission from the City of Barre through the Stone Legacy Fund. This design is based on incorporating a metal bicycle rack. Two granite sculptures adorn either end of the metal rack. The design is a throw back to the days of carefree daredevil ramp jumping big wheels. It shows children in motion. One child going for the initial launch off the ramp and over the rack; another child landing after the big jump. These photos show part of the carving process; from the raw stone block which was sawn in half to provide stock for both sculptures to 2/3 complete. This piece is on site at Charlie's Playground in Barre, Vt. 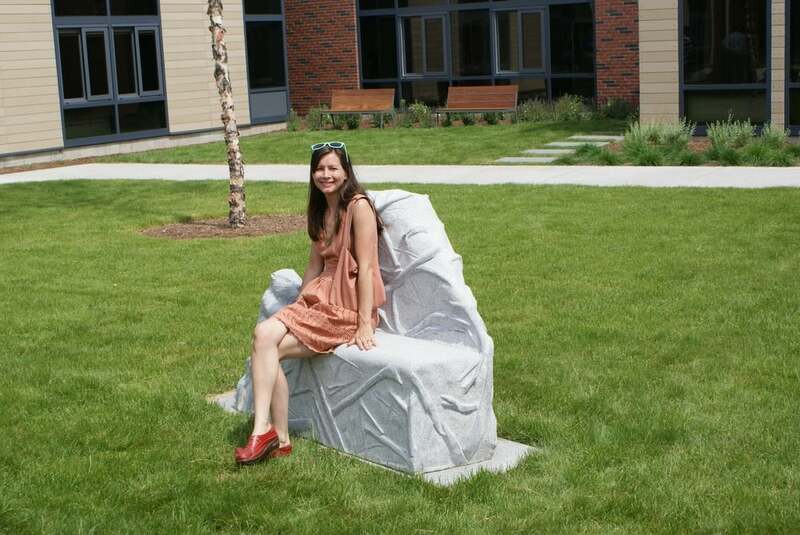 In 2012 I was awarded a Public Commission from the City of Barre through the Stone Legacy Fund. Selected and created to honor Barre's granite workers, this sculpture is an interactive experience. Four standard split rock benches include detailed hand carvings: replicated tools of the trade and items of everyday life. The historical narrative is located in front of Positive Pie at Barre's City Place 219 North Main Street. It provides a glimpse of Barre's traditional art community and the city's reputable history. The bottom photographs show the first two parts of the sculpting process: acquiring the perfect stone at the quarry and having the seat area sawn with stone stock left for the hand carvings. The third photograph shows the benches in stage 6: all carved items covered with rubber waiting on the line to be sandblasted. 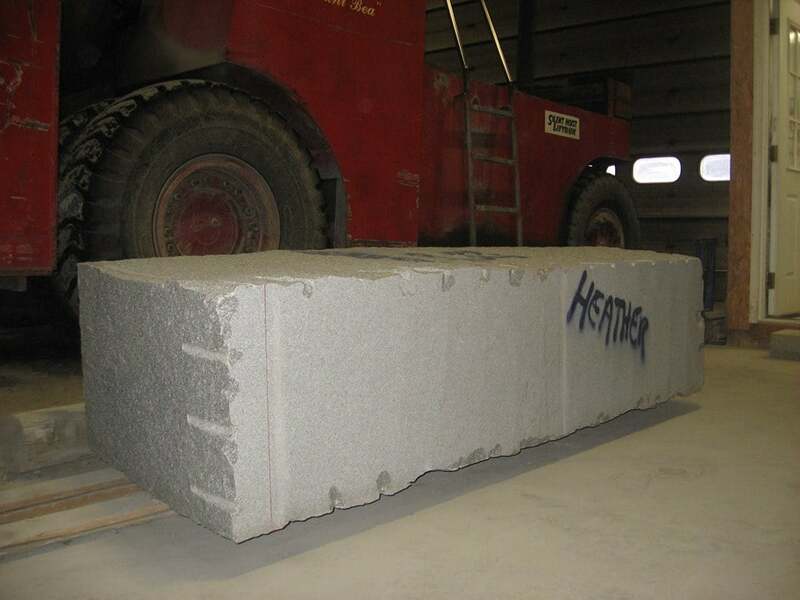 The sandblast stage is known as "dusting" and gives all exposed rock a uniform texture by spraying it with steel shot. Just the seat and area around the items were dusted. The rubber is glued on to protect the detailed carvings during the sandblast process. The raw rock sides were painted with glue. The benches were then "dusted", rubber removed, washed, transported, then set on site. 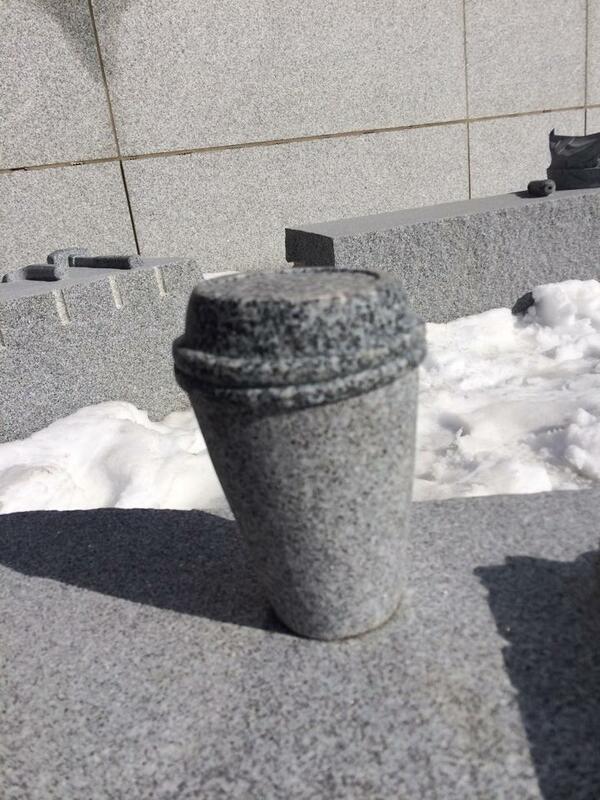 All items were carved directly from the original stone. They include: hammer and chipper chisel, lunch pail and thermos, crane controller and coffee cup, and pneumatic air hammer and paper hat. The paper hat is a historical nod to the Italian immigrants from Carrara who used to make paper hats from their Italian newspapers to keep the granite dust from getting in their hair. Included in a team of 5 local sculptors, I contributed to this project in context, design, craft and installation. Chosen in 2014 to create granite sculptures for the Central Vermont Medical Center Psychiatric Hospital, our proposal was based on the idea of animals providing comfort and healing to patients. Funded by the Vermont Arts Council and selected by a committee consisting of over a dozen people (including engineers, state employees, nurses and hospital staff) the sculptures emulate the hospitals mission of compassion and quality care.